Negative online reviews can have a negative impact on your practice – unless you know how to properly handle them. You’ve been working on your online reputation for your office. You read about why an online review presence is important, and started improving it. What do you do if you received a less-than-great review from a patient? Don’t worry, it’s not the end of the world for your practice – promise. Just follow the steps below and turn this unhappy patient back to a fan of your practice. It is important to be prepared, rather than reactionary, when taking control of your online reputation. This includes when you receive a less-than-favorable review from a patient, and deciding how to respond to the review. Over half of consumers (57%) will avoid a business that has negative online reviews.1 We all know that ignoring something doesn’t make it go away. This is especially true with what is written on the internet. Now that you know why you should respond to these reviews and how it can have a positive impact on your practice, follow these easy steps below to rectify any bad review that you receive from a patient. 1. Keep up-to-date on your online review presence. Dedicate a responsible employee to regularly check your online review presence. This includes scouring popular review sites that patients can be leaving reviews for your practice every few days. 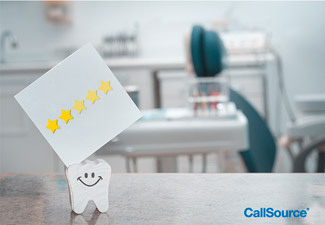 Or, if your budget allows, use an online review platform such as CS Reviews to automatically be alerted any time a review for your practice is left on a multitude of review sites. 2. Respond in a timely manner – at least three days. Studies show that over half (56%) of consumers feel it is reasonable to expect a response to their review within a day.4 Make sure that you plan your response with the next steps in a reasonable amount of time so that you may respond to any online complaints within this time frame. If a review speaks to a specific event, problem, or situation, be sure to check internally to get the full picture of the entire situation, so you can speak to it with knowledge and rectify the situation. You also want to make sure this isn’t a fake review that was written to try to give your practice a bad reputation. Receiving fake or defaming reviews for your business? Here’s how to try to rid your practice of these types of reviews, step-by-step. Do not hurry and type whatever comes to mind – make sure you have researched the situation, have a clear head, and are not being reactionary. Proofread. Don’t just apologize, be actionable. Make sure to draft the response from management or leadership. 5. Include any personal contact information, if necessary. Sometimes it’s better to bring the conversation one-on-one, instead of continuing in an open forum such as on a review website. If you believe that your response needs to have a more personal reach-out, or if you want the patient to answer you, you may include in your public response that you will also be sending them your person phone number/email to hear more about the situation and rectify it further. Once you say this, send a private message to the patient to address the situation they spoke to. It shows other reviewers that you care enough to speak to them personally, and hopefully turn a bad experience into a good one. Want more help with your review presence? Speak to a specialist today to discover how CallSource can help. If you want to see examples of what not to do and some of our favorite review responses, watch this video. 3. Wang, Yang, and Alexander Chaudhry. “When and How Managers’ Responses to Online Reviews Affect Subsequent Reviews.” Journal of Marketing Research (In Press).